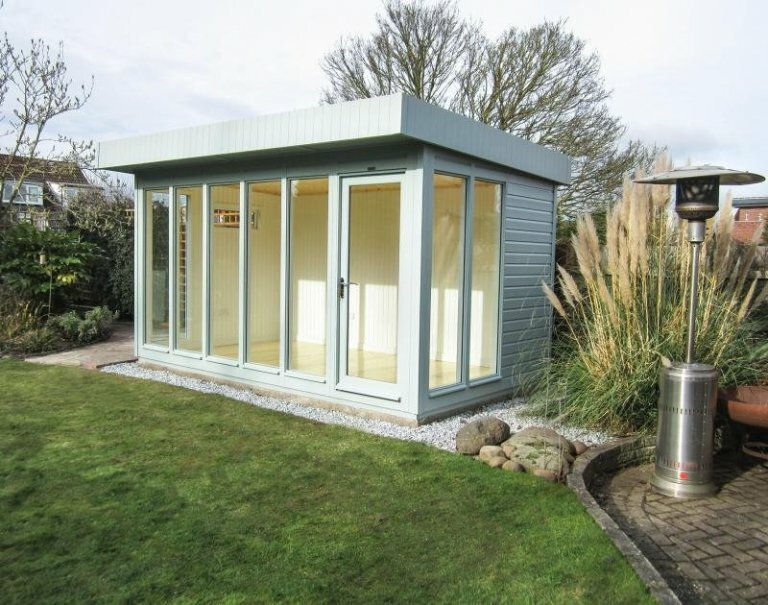 This modern looking garden building is our Salthouse Studio, and this one has been installed in our customer’s garden in Radcliffe-on-Trent, Nottinghamshire to use as a contemporary styled garden room to relax in and enjoy their garden from. 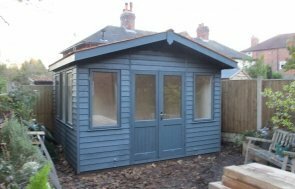 At 2.4 x 4.2m in size, the customer has got a long, fairly narrow building, so as not to encroach too much into the depth of their garden. This will allow them to set up the inside with a couple of nice chairs, maybe a few shelves, a little table and a lamp, creating a living room set-up in their garden. The Salthouse is our most modern garden building in design, with its pent roof, full-length glass panels for the doors and windows, and roof overhang. The customer has furthered this modern look with their style choices of have polished chrome door and window furniture, and painted matchboard lining in Ivory. 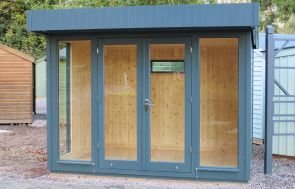 Our Garden Studios are perfect for year-round use, as they all come with full insulation, double glazing, matchboard lining, and draught excluders in the doors and windows. This customer also opted to have an electric pack. Heavy duty felt has been used to protect the pent roof, and the paint colour the customer chose is Verdigris, which is a natural green/blue colour from our Valtti Paint Range. 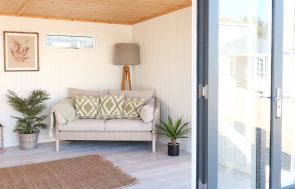 If you like the idea of having your own modern garden room, and like the look of our Salthouse, you can create your own design by using our Online Garden Building Planner Tool, or you can come and visit our Nottingham Show Centre to draw inspiration from our show buildings on display. If you have any queries for our team you can Contact Us, Request a Callback or call 01760 444 229.